My goal is to combine my cycling vacations and helping others. If you like my pictures (and in the future also short videos), reports and experiences from my journeys „with bike and tent“ and you want to do something good at the same time, then please support my charitable fundraiser. Inform and donate: „Exchange journey impressions for charity donation“ on betterplace.org. 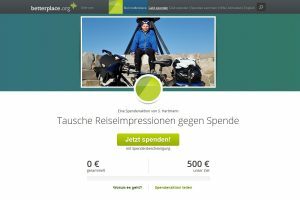 Donating via betterplace.org (the largest donation platform in Germany) is safe and uncomplicated. Apart from an administrative fee of 2.5% that the platform keeps to cover transaction and banking costs, all of the money will be passed on to the three projects above. The timing depends on the accumulated sum and possibly also on each project’s status. If a project is already fully funded, I will pass the money on to it anyway, because extra money is always needed and appreciated. You can find more information about betterplace.org here.